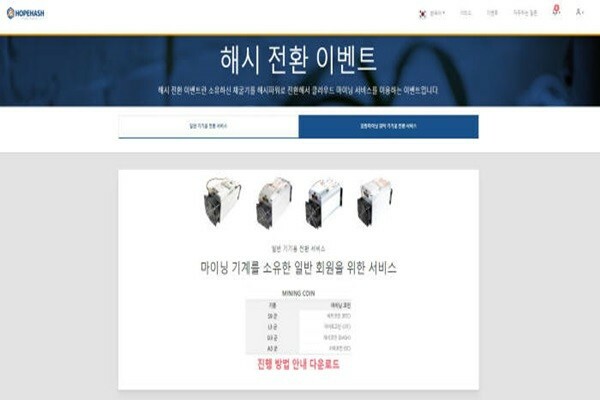 South Korean mining service provider called HOPEHASH (CEO Choi Sung-hoon) made an announcement that it will be carrying out ‘Hash Conversion Event’ for customers that are using its consignment mining service and customers who possess its miners. This event measures computing power of miners, converts computing power into hash which is then used by HOPEHASH’s Cloud platform. “We have come up with this event due to increase in number of South Korean consumers who are looking to mine in different countries where electricity bills are relatively lower.” said CEO Choi Sung-hoon of HOPEHASH. To provide less expensive Cloud mining service, HOPEHASH constructed mining centers in 7 countries where electricity bills are relatively lower than that of South Korea. It successfully constructed a mining center in Novosibirsk, Russia and is currently operating the mining center. HOPEHASH lowered electricity bill of using Cloud service for mining Bitcoin to 6 cents. This is the lowest commission of Cloud mining service in the world and it still provides profits even when Bitcoin price goes down to $3,000.